On a cold and slushy November night in 1964, Jim Hill Sr. and the late Jack Dalton sat in the Derby Tavern on Gottingen Street. At the time, the Derby was the only place in Halifax you could get a steak and a beer. In stumbled a small boy, no more than eight years old. His toes were sticking out of his shoes, and he shivered from the cold. The young panhandler began to circle the room, only to be firmly removed by the bouncers. Not moments later, the persistent panhandler returned, but was removed once more. On his third return, Jack insisted they find out what was behind the child’s tenacity. A young mother and baby sister were at the boy’s home, desperately in need of bread and milk. The boy was determined to get enough money to bring these necessities home so his family would not starve. A hat was passed around the tavern and the patrons raised $15 for the lad, an astonishing amount in 1964. While the boy left happy, Jack and Jim couldn’t help but wonder what the child’s family would do for Christmas. They sat at the Derby half the night discussing the child and others like him – they knew there had to be a solution. As Jack worked at the most popular local radio station and Jim at the television equivalent, surely together they could do something to help. After discussions with the president of CJCH television and radio, Jim and Jack were sent away to iron out the details. They came back with plans for a telethon, and the president graciously donated use of the station and airtime. The men then approached the CJCH staff for their time and abilities. Inspired by a similar radio telethon in Boston, Halifax’s Christmas Daddies was born. That year, the first Christmas Daddies telethon went on the air at midnight. After only two hours on air, concerned citizens were coming in off the street, offering anything they to could to aid this worthy cause. The telethon raised $1,500 that first year and received extensive media coverage. The next year support grew to an incredible $5,000. Jim and Jack were overwhelmed with the positive support they received from the public. Since the telethon’s first year, Christmas Daddies has grown steadily, and to date has raised over $27 million for less fortunate children. 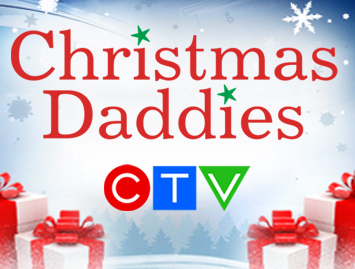 The staff of CTV (formerly known as ATV) are proud to continue the Maritime tradition of the Christmas Daddies Telethon, held each year in early December. Each year over $500,000 is raised, and 100% – and sometimes more! – of the pledges are honored. CTV continues to donate the technical equipment and airtime for the event, and over 250 volunteer staff, family members and friends donate their time and services to make the telethon possible. Christmas Daddies’ mandate is to provide less fortunate children with gifts at Christmas including toys and food. Christmas Daddies funds are distributed through The Salvation Army. Their commitment to those in need makes them the most appropriate candidate to disperse the Christmas Daddies funds. The concept of Christmas Daddies originated in Halifax and was an effort put forward by the staff, who volunteered their time to put on the telethon. That spirit of volunteerism continues today with the staff, family and friends of three stations located in Halifax, Moncton, and Sydney. In true Maritime spirit, the telethon embodies the warmth and generosity of our community through dedicated volunteers and generous donors.